Star Wars' Millenium Falcon, and Star Trek's USS Enterprise...is it really fair to compare the two? Not really, but that hasn't stopped legions of fans from debating the merits of both for decades. 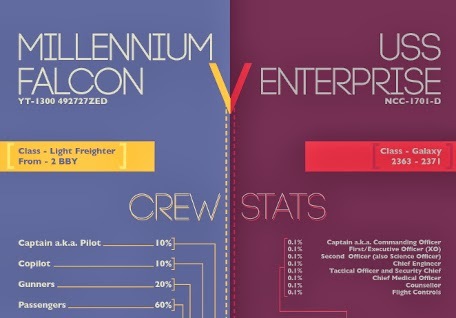 This infographic lists numerous key facts about the two iconic spaceships. What do you think of the infographic? Which is the best ship? I loved that this particular infographic just kind of turned into gibberish.